New York is filled with beautiful hotels; big hotels, boutique hotels, hotels steeped in history and even haunted hotels. And while I did grow up in ‘hotels’, but they were more the two-storey, meat trays on Saturdays kind, as opposed to the room service and white fluffy robe kind. If minimalist is your preferred style, NYLO New York, on the Upper West Side of Manhattan, is the kind of boutique hotel that you will want to move into. Permanently. From the moment you walk through the front doors, NYLO (which stands for New York loft) has nailed industrial chic with brick walls, concrete floors and exposed beams. LOCL Bar is open all day and evening and features cocktails, coffee and bar snacks. There’s also a library furnished with an original 1910 fireplace, velvet sofas and board games and a business centre with free internet (WiFi can be purchased for use in your room). I stayed in a NYLO Deluxe King room which was incredibly light and airy and well sized for Manhattan, offering enough space for me to completely unpack my bags and scatter my shopping, and get comfortable.My room was filled with natural light from the large windows, warm coloured soft furnishings, and wood flooring. It also had mood lighting, a wall mounted flat screen TV and an in-room safe large enough to fit a laptop..
And then there was the bed. WOW. Even though I was in the city that never sleeps, I had just one thought on my mind when I arrived in New York … going to bed.A 24-hour flight delay and an unexpected 2am check in at an airport hotel in Miami, meant all I wanted to do was stretch out and sleep somewhere nice. And the custom-designed NYLO NYTE King Bed mattress made all my dreams come true.Each NYLO bed comes with combed cotton triple sheeting which makes for a VERY comfortable night sleep, although if you’re an active sleeper (cough, cough), prepare for the bed to move around a bit. As well as a cupboard with built-in shelves, and an iron and ironing board, there’s also a desk/bench with cubby-style cubes which are great for storage, and filling with all your shopping..The industrial theme continued in the bathroom with a metallic sink, but then it’s pampering all the way with great shower pressure and a luscious selection of Pure by Gloss amenities – including face bars, shampoos and body lotions. The lemon scented soap was so good I smuggled a few blocks home in my luggage. For those after a room with more of a view, a number of Deluxe rooms on the upper three floors of the hotel offer balconies and stunning views of the New York City skyline, Central Park and the Hudson River. With no room service or mini bar (I found this a bit of a disappointment, especially when I was really hungry after a big day out sightseeing) but you can get snacks from the lobby bar, LOCL. Instead, I popped down to Serafina Restaurant, an Italian eatery which is part of the hotel complex, to order a takeaway pizza. Chances are, if you’ve seen a leafy, residential Manhattan neighbourhood depicted on TV or in the movies, it was the Upper West Side.Chuck Bass owned a hotel there on Gossip Girl (you can even visit the Empire Hotel bar and have a signature Chuck Bass cocktail), it’s where Meg Ryan and Tom Hanks lived in You’ve Got Mail, where Jerry made his home on Seinfeld (and in real life) and where Liz Lemon lived on 30 Rock. 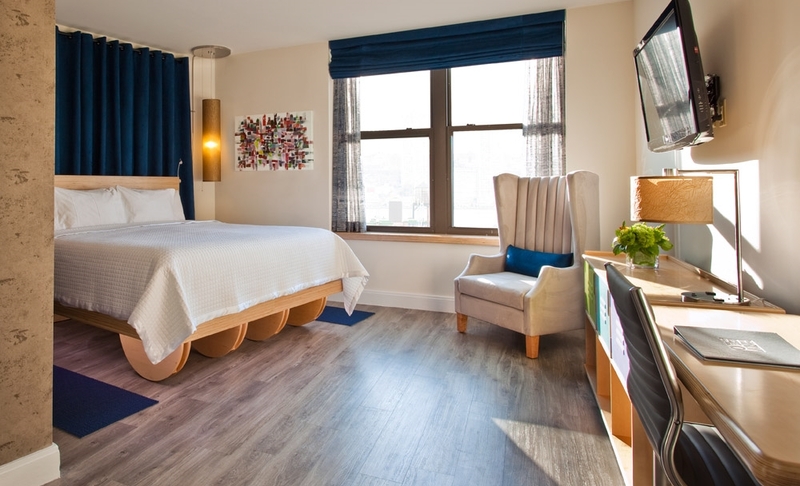 Located 10 minutes from LaGuardia Airport and 20 minutes from JFK, NYLO New York is also close to two subway lines, putting guests just minutes from almost anywhere in Manhattan. If people watching is your thing, the hotel is also a short walk from the American Museum of Natural History and Central Park, so head to Zabar’s, a gourmet epicurean emporium on Broadway, for a coffee and breakfast bagel and walk to the park to watch the city come alive. As you walk the streets, you’ll feel surrounded by locals rather by tourists, with some great shopping, dining and dessert options in the area, including my new favourite ice creamy, Emack & Bolio’s. 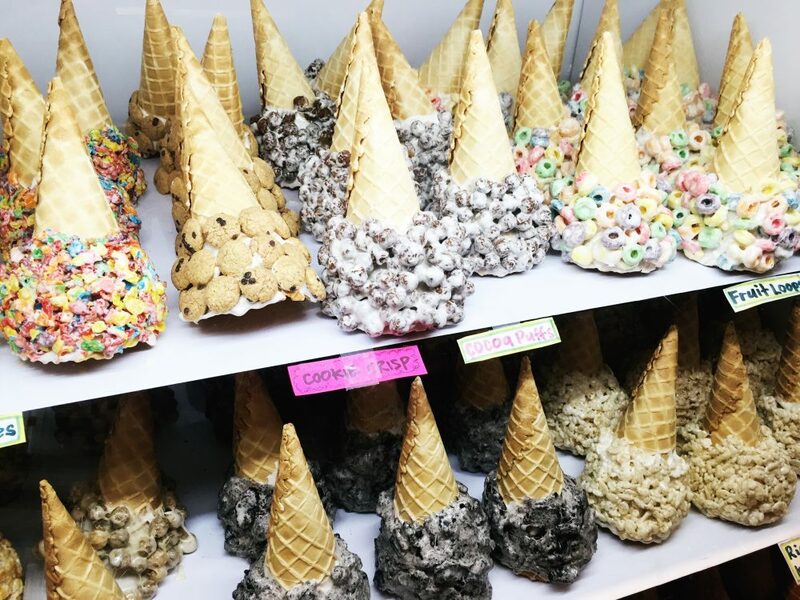 A ‘must visit’ for anyone with a sweet tooth, this award-winning ice cream franchise has been credited with inventing the flavoured cone in 1980 and now boast insta-worthy flavours including Oreo, Reese Puffs, Nutella and even Fruit Loops. If you’re heading to New York and want to base yourself on the Upper West Side, or are simply keen to escape the hustle and bustle of the main tourist areas, I’d recommend NYLO New York as a place to stay. The staff were friendly and accommodating and I was given free WiFi access for the length of my stay as well as a couple of free drink cards for the bar. Perfect for: stylish city breaks and romantic weekends away.Find NYLO New York at 2178 Broadway, New York. Are you planning a trip to New York and considering a stay here? If you enjoyed this post or have any questions about this hotel, please leave me a comment in the box below! Hi Brooke, sounds like NYLO was a great place to stay. I’m planning my first trip to NYC at the moment. I am a solo traveller and was thinking somewhere like NYLO for 4-5 nights followed by somewhere like the Standard East Village for 4-5 nights. How long did you stay at NYLO? Hi there! I was at NYLO for ooh, 6 nights I think. Flight delays meant I lost a night.